Knowledge about Japanese culture, business ethics and (music) markets is being presented by experts in seminars and compiled into reports and presentations made available on Finest Sounds website. Method - Seminars in Helsinki and Tallinn; reports available on Finest Sounds website. map relevant contacts and plan the next concrete preparatory steps and actions. Method - Individual sessions curated by Music Finalnd & Music Estonia respectively. 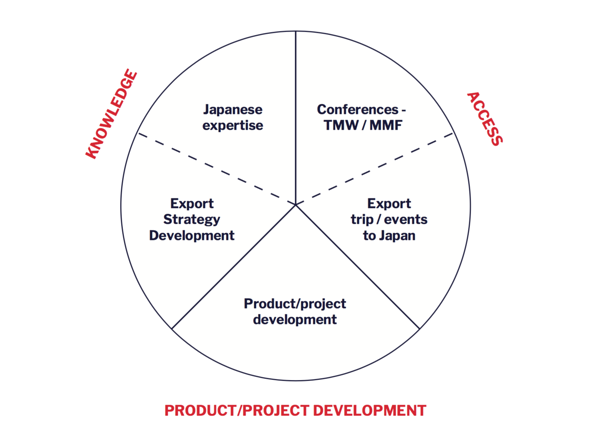 Outcome - Mentored companies have an action plan with suggested preparatory steps and a list of relevant Japanese contacts to target through Finest Sounds networking opportunities. Music industry festivals Tallinn Music Week and Music & Media Finland are perfect platforms to feature a number of Japanese music industry professionals in panels, networking sessions and also offer other relevant opportunities for participating project partners. Pricing - Finest Sounds does not offer free access to the festivals for project participants. If participants are delegates, they have access to Finest Sounds related special events (seminars, networking sessions etc). Method - Participation in the trip is organised and curated by Finest Sounds team. Pricing - For music companies participating in Finest Sounds about 65-75% of the travel costs (flights, accommodation) will be subsidised. For non-music companies there is no subsidy for travels or other costs, but all Finest Sounds events will be freely accessible. already successfully exporting to Japan (e.g. Finnish and Estonian design, lifestyle brands and technology companies) in order to enhance both parties visibility and to boost sales in Japan. Various matchmaking events are taking place to initiate contact between companies from various sectors. Also, concept ideation and development is being done in cooperation with several universities and experts. Method - Matchmaking sessions. Concept development workshops at universities. Outcome - Ideas about how to combine music and brands, products or services from other sectors have been developed for particular pairs of companies. Resources - Finest Sounds does not offer resources to professionally produce campaign or other promotional materials worked out in the concept development phase.